FIGURE 16. Patient wearing a forelimb prosthesis with self-suspension of the socket, which makes use of the anatomic shape of the residual limb. Dr. Davidson is a clinical professor of small animal surgery at Texas A&M University. 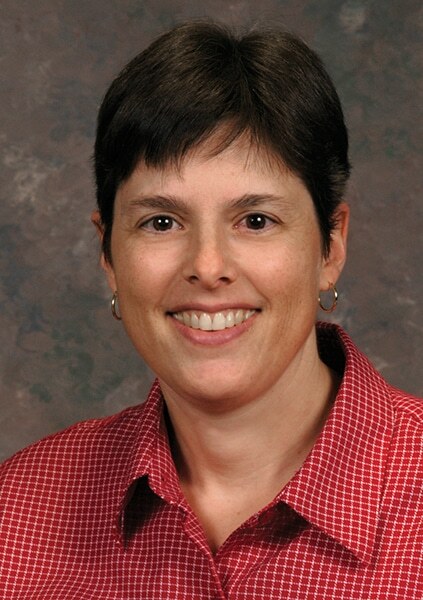 She received her DVM from University of Minnesota and completed her surgical residency and MS at Purdue University. Dr. Davidson has also completed certification courses in veterinary pain management, chiropractic care, acupuncture, and canine and equine rehabilitation. To learn more about companion animal rehabilitation and sports medicine care offered at Texas A&M University, visit vethospital.tamu.edu/small-animal-hospital/sports-medicine-and-rehabilitation. Can you tell us, as a veterinary surgeon, how you came to be interested in the field of prosthetics? About 15 years ago, I became interested in ways to improve postoperative recovery. I began taking continuing education (CE) courses, which ultimately resulted in certifications in rehabilitation through the University of Tennessee (utvetce.com), and later, through the Canine Rehabilitation Institute (caninerehabinstitute.com). However, in some of the CE programs, there was limited information on using prostheses. In fact, I did not have the opportunity to work with prostheses until developing a relationship with a local prosthetist who was interested in working with animals. How do you evaluate whether a prosthesis would be a good option for a patient? For the type of prostheses we have used (stump socket prostheses), the amputation needs to be in the distal limb, typically below the elbow or stifle. Dogs and cats usually adapt quite readily to walking on 3 legs. However, it does alter their gait and can result in compensatory problems in other areas of the body, such as other legs or the spine. These issues may be subtle in many cases. Pain or difficulty walking may be more apparent if there are preexisting problems in another limb. For instance, a dog that needs a front limb amputation may already have some limitations due to osteoarthritis in the hips. In that case, a prosthesis may be more strongly considered for the front limb, particularly if the condition is amenable to a distal amputation. How does quality of life figure into the decision to use a prosthesis? The ability to bear weight on all 4 limbs can reduce secondary pain issues or development of compensatory problems. Having all 4 limbs also enables a dog to maintain a very active lifestyle. However, the length of time an animal has been missing a limb is a consideration. Sometimes animals have adapted so well to 3, or even 2 legs, that they have to learn to walk all over again with a prosthesis. 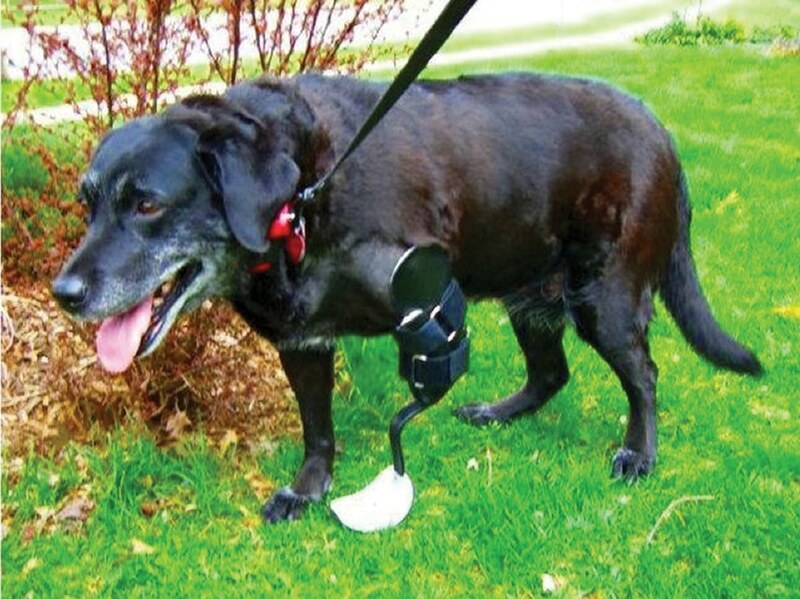 Having said that, most dogs adjust to using a prosthesis within minutes to hours. Typically, the prosthesis only needs to be worn when the animal is active (not while resting or sleeping). This means that family members must apply the prosthesis when needed and monitor the stump for any potential skin problems or wounds. In addition, over time there will be some wear and tear on the prosthesis, necessitating repairs or replacement parts. While this is generally inexpensive, it is a potential hidden cost that clients need to know about before making the decision to invest in a prosthesis. Therefore, the prosthetic piece must be appropriate for the type of amputation needed, but the family must also be prepared to manage its use. The perceived quality of life by the animal’s family is an important consideration when deciding whether a prosthesis would be appropriate. For some people, the idea of having a pet with a missing limb is not acceptable. It may be a psychological issue for some members of the family. For others, it may be an overwhelming concern that the animal cannot do well with fewer than 4 legs. Do you have any anecdotal evidence of how a prosthesis has contributed to a better life for an animal, or contributed to the human–animal bond? The families that we have worked with have been very happy with their decision to obtain prostheses for their animals. Their pets have returned to a lifestyle that is essentially unchanged from the one they enjoyed prior to surgery. Although I have no personal experience with pediatric amputees, I have heard stories of animals with prosthetic limbs being used as therapy dogs for children who are amputees. The children can apparently identify with these dogs, and they better internalize the concept that they are not “weird” and can enjoy life as much as anyone else. What do you see as the future for prosthetics in the veterinary profession? Veterinary prosthetics is still in its infancy, but I think the number of clients who request this option for their animals will continue to grow as more people become aware of its availability. Also, the quality and fit of prostheses will continue to improve as prosthetists learn by their various experiences. A prosthesis is not essential for every amputee, and it may not be appropriate for some. However, it can improve the quality of mobility for many animals, and clients are satisfied knowing they have provided their pets with the best possible quality of life. For more information about indications for, and the use of, orthopedic devices in dogs, read Canine Orthopedic Devices in the January/February 2016 issue of Today’s Veterinary Practice, available at tvpjournal.com.